Loch Seaforth is an impressive sea-loch that divides Lewis and Harris. Once, before the Western Isles were granted unified local authority status, it marked the boundary between Ross & Cromarty and Inverness-shire. 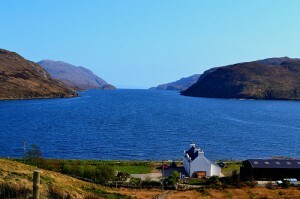 A short walk behind the Rhenigidale hostel takes you close to where the Loch meets The Minch. 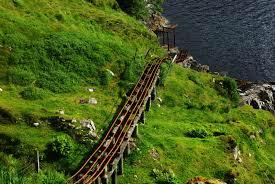 Here there is a holiday cottage where construction work was undertaken with supplies landed on the rocky coast and hauled up to the house on what appears to be an improvised roller-coaster. Across the stretch of water is a vast uninhabited area, The Pairc, which, even when peopled, lacked roads. The settlements, now deserted, were all coastal.